The 1965 adventure will crash onto Blu-ray this August. In an early announcement to retailers, Olive Films has revealed 'Sands of the Kalahari' will be available on Blu-ray on August 2. Directed and co-written by Cy Endfield, the movie’s cast includes Stuart Whitman ('The Longest Day') as a businessman and big-game hunter, Stanley Baker ('The Guns of Navarone') as a chain-smoking and alcoholic mining engineer, Susannah York ('Superman') as a beautiful young divorcee, Nigel Davenport ('Zulu Dawn') as the plane’s captain and Theodore Bikel ('The African Queen') as a doctor. Specs and supplements have yet to be revealed, but suggested list price for the Blu-ray will be $29.95. 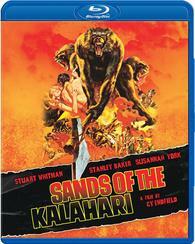 You can find the latest specs for 'Sands of the Kalahari' linked from our Blu-ray Release Schedule, where it's indexed under August 2.